Towards the middle of AR Rahman's concert on Sunday at Los Angeles' Hollywood Bowl venue, the city's philharmonic orchestra started to play the theme from Bombay -- by all counts the best score by the Indian composer. It was a magical moment, as nearly 18,000 people in the audience sat in hushed silence under LA's clear sky facing the unlit Hollywood sign. There was a chill in the air (the weather had been beautiful in LA), and the loud, but sweet and simple sound of flute played by Naveen Kumar, followed by souring violins that filled up the venue, gave me goose bumps. I just wish the rest of the concert had been this magical. There was a huge build up to the show, and some interesting opening acts that energized the audience -- Karsh Kale playing pieces from his new album Cinema, Rhythms of Rajasthan -- a folk troupe performing Nimbooda Nimbooda, and a local dance group -- Bollywood Step Dancers dancing to Beedi and Let's Have Some Ronak. Many people stood up and began to dance to the upbeat Bollywood songs. There was hope for a lot more of that when Rahman's performance started. After all, that is what Bollywood shows are about -- singing and dancing to our favorite film songs. Rahman's concerts have always been superior in staging than the other Bollywood shows. The composer himself is the star, as is his music, the singers and those fabulous songs. But this Sunday's show -- Journey to India -- was very disappointing. During the evening, the composer walked on to the stage a number of times, read prepared introductions to each music segment -- as if he was speaking to an audience that he presumed was not familiar with his music and films. Then each time he would leave the stage, while an American conductor along with a large group of musicians from the Los Angeles Philharmonic, played the compositions from the films. For a while the staging and format of the evening looked impressive. In the center of the stage was a giant screen (along with four other smaller screens on the sides) projecting images from each film that Rahman introduced -- Lagaan, The Rising: Ballad of Mangal Pandey, Endhiran, Roja, Ravaan, Water, Warriors of Heaven and Earth (the 2003 Chinese period film Rahman composed music for), and the only India-themed film that many Americans seem to have seen -- Slumdog Millionaire. The projection was stunning, crisp and clear and initially everything looked spectacular. But then the format began to appear dull and repetitive. There was some singing by local singers -- Stanford University's Raagapella and a Cal State Fullerton group, but it was mostly uninspired. Rahman did sing Jai Ho in the end, but by that time the audience was mostly bored. Many had left since it was cold and late. After all Monday was a working day. Since the big success of Danny Boyle's Slumdog Millionaire, Rahman has been trying to develop a strategy to make a big splash in Hollywood and mainstream America. But his two subsequent soundtracks for Couples Retreat and Boyle's 127 Hours -- for which he won two Oscar nominations, did not make much of an impact. Until now he is known in America for only one song -- Jai Ho. He has sung the song everywhere, from The White House to performing with the Pussycat Dolls. Last year's Jai Ho concert tour with white American dancers, performing to Rahman's Bollywood and Tamil film songs brought a very small number of non-desis to the shows. By looking at the audience at this Sunday's Journey to India concert it was evident that most of them -- nearly 80-90 percent -- were of South Asian origin. 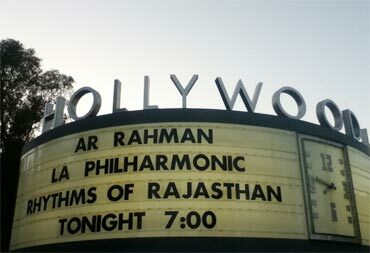 Clearly Rahman had hoped for a larger non-South Asian audience at the Hollywood Bowl arena, otherwise why did he read descriptions of his films that desis are already very familiar with? It was as if Rahman wanted to show his skills as a composer to what he was hoping would be the new Americans in the audience -- trying to place himself in the league of men like John Williams and Hans Zimmer. 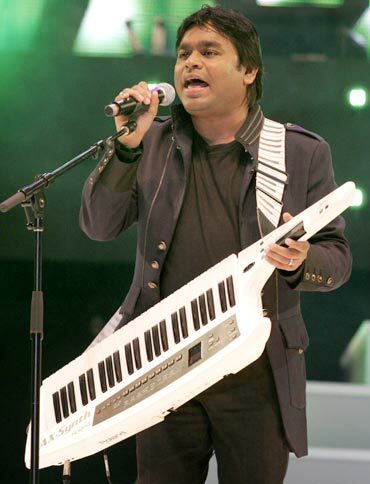 Rahman's talent is unquestionable -- but so far it has only been reflected in the Indian film songs he has composed. On Sunday evening, after a while all of his background scores began to sound alike. The opening segment with clips from Endhiran was a wrong choice to introduce his work to the uninitiated. Rajnikanth's fans may have been thrilled, but my two American friends were shocked by the crudely made scenes from the film. The segment from Roja flowed much better with a hint of the film's songs in the score. The clips from Lagaan were rousing, but the entire musical interlude gave no sense of the film's hit songs -- Radha Kaise Na Jale, O Rey Chori, Mitwa and Ghanan Ghanan. And that is how the rest of the evening went along -- orchestral music that began to sound mediocre and repetitive, but no songs. What a shame, since we had hoped to dance to Chaiyya Chaiyya under Los Angeles' clear sky.